If you share your PC with others or let friends use it when they come to visit, you may find settings changed, files deleted, programs installed etc. when you next use it. With previous versions of Windows, I’ve used Windows Steady State, which provided a mode to allow access without setting complicated policies to protect your settings. Thankfully with Windows 7, Microsoft has made this level of protection much more readily accessible. 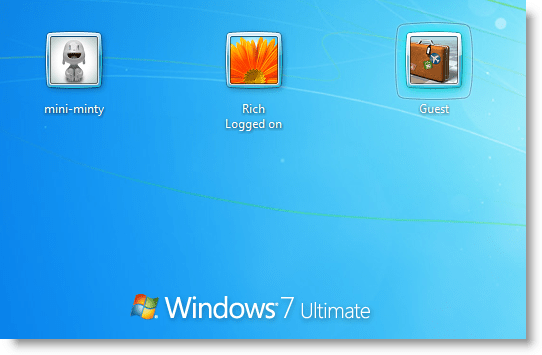 Learn, in this guide how to set up a Guest account—available in all Windows 7 and 8 versions—for infrequent users of your PC. We have from time to time presented you with the great video tools from WinXdvd. This Easter they are once again hosting a giveaway. YouTube downloader and DVD burner. Convert videos to iPhone, iPad, iPod, PSP, Android, etc. This is a fully working version. Once your downlad has started, click on through to page 3 (click Next Twice) for the serial. Head on over to: http://www.winxdvd.com/giveaway/software-deals-easter.htm for your free copy of WinX HD Video Converter Deluxe V3.12.6. They say that your desktop (the real thing, not your virtual one) shows what goes on in your head. The pun is an empty desktop surface vs. your mind. I admit, this post is inspired by a similar article over at Verge. That being said, I think it would be interesting to see what your Windows Desktop look like. Do you like your desktop to be neat and tidy, or is it all havoc ? Show us your mind. I’ll go first and share my desktop with you all. There’s no denying, I’m a big fan of Rainmeter and I believe my desktop shows it. Tidy yet informative. Send your desktop images to competition@mintywhite.com (no, there’s no price other than fame and glory) or post a link in the comments below. When you store your data with a third party provider like Dropbox, you put trust in the storage provider’s security controls to protect your data. While all good storage providers encrypt their data locally and during transmission, you can add an additional layer of security to really lock down your data and keep prying eyes away. In the past, we’ve shown you how to create a secure, encrypted volume on your PC or USB drive; however, you need to use a PC to access the data. In this guide, we share an application that encrypts your data while still providing access to your data from any Windows, Mac, or Linux PC as well as from an iOS, Android, or Windows RT device. Often we face errors on our PCs which, with a quick web search on the error text, are easily resolvable. Did you know you can copy the contents of an error message (or any dialog box) to your clipboard? When you’re faced with an error, press Ctrl+C to copy the error title and text to your clipboard. Simply paste the error message into the search field; I find this a lot quicker than transcribing the error message in to your favorite search engine yourself. In this guide, you will learn what the Windows Registry is, how to access and configure it, and how to backup and restore it.